This entry was posted in USA Immigration and tagged US P-1 visas US work visa on December 12, 2017 by Blog Author. When one watches a game, apart from the pace of the game, or the performance and strategies of the players, a fan does not realize that a few players are not American citizens. When a person does not wish to become a citizen of the United States but is interested to work for it, he/she applies for the US work visa. Such a visa permits a person, hailing from another country, to do work in the US, without worrying about deportation. Visas are considered for the purpose of travel, (which includes work), and also for students and tourists. There are many types of work visas, based on the time of the job, and the type of occupation which a person aims to do. When an athlete, foreign to the US, decides to play in the National League of US, an application for a P-1 visa is mandatory. 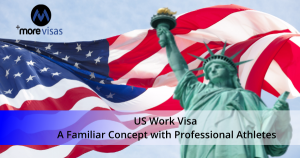 A work visa is the permit to perform an explicit job, in the United States. US Work visas allow skilled people, to fulfill job positions that face great demand. They need not necessarily be citizens of United States but can work in the country. All Athletes and the members of music groups belong to the category of P-1, covering team members, or individual athletes. The Department of State of USA defines, this visa, as a permit, to perform at a specific athletic competition, as an athlete, or as a member of an entertainment group. It needs a recognized and international level of persistent performance. It includes persons, who are providing fundamental services, in supporting, the individual mentioned above. P-1 visas are terminated with the retirement of the player. Normally, a work visa does not exist forever. There is a time frame for working visas, and it also has a renewal process, if needed. Time and again, athletes submit an application for United States citizenship, after gaining a P-1 visa. An athlete is required to meet two basic requirements, regulated by the United States Government, prior to applying for a P-1 visa. These are, the athlete needs to take part in the sport, for a considerable time, before playing in the US, and that the player, needs to have competed earlier, in the national team in the country, of their origin, to prove that the player, is well-ranked and possesses proportionate skills, showing that they were awarded well, for their athletic and sports abilities. There are several players in the national sports league of US, who are not native citizens as per an expert. The professional athlete generally receives P-1 visas; and the USCIS recognizes players of e-sports, also under the jurisdiction of P-1 visa. Video-gamers from across the world, who possess a Professional approach, can submit an application, for the visas, to play in local tournaments, held in the United States. Today many citizens of non-US countries play sports. There are several players from varied citizenship status from the world who play for the United States.